This is not the first time I have written a post about Make Up Geek but my original one is still in drafts, never quite making the cut. Not because the product wasn't good but because I didn't like my photos and I was reviewing too many eyeshadows at once and you know, #bloggerproblems. My first Make Up Geek order was for a bunch of the foiled shadows and I was really impressed. The pigment and lasting power are great, my only bugbear was that the shadows were quite crumbly and chipped easily. I also didn't buy shades that you would call 'everyday wear/suitable for the office' so I have found they sit in their Z palette and don't get much attention. Maybe one day that post will get published but for now I bring you my 4 new additions to the family-Shimma Shimma, Steampunk, Havoc and Creme Brulee. And these shadows are getting a lot of my attention. So there is a backstory to this selection of shades-I was bitching one night to Tasha from The Cosmetic Aesthetic because I had placed a big order with Beauty Bay and they wouldn't deliver to my UK freight forwarding address. This make up junkie was not a happy bunny because I just needed all the Make Up Geek ok? And that desire was fuelled by Laura who is a bad bad person, especially when you're on a pre-Xmas no buy. And then on Xmas day, amongst all the other beautifully wrapped gifts from Tasha were these four shadows-all ones I had tried and failed to order. And I could not be happier with her/my choices! Shimma Shimma is a shade everyone needs in their life. I am sure I must have 64 others like it (and looking at the Temptalia comparisons I do own a fair few) but it's the sort of shade I always hit pan on. I find shimmery champagne shades so versatile-for inner corners, brow bone, and if I am feeling especially sleepy-all over the lid. I think Shimma Shimma is brightening without being stark and is easy to work with. Tempted to order a back up right now. Creme Brulee is perfect for pale girls like me as a transition shade in the crease. I now have a massive appreciation for matte shades-it took me 35 years to get out of my 'shimmer only addiction' but hey, better late than never. I am the girl who didn't eat a prawn til I was 29 and didn't try cauliflower cheese until I was 32. Creme Brulee is soft, blendable and I tend to whack it in the crease first and then blend another shadow on my lid and outer corner into Creme Brulee. It's pretty foolproof. Sometimes I feel it's a little orange on me but once I have the rest of my eyeshadow on I realise it is pretty perfect and gives the overall eye that soft-focused and blended out look. Now it really starts getting interesting. Havoc is amazing. It's kind of MAC Club-esque but waaaay easier to work with. I find Club can be pretty dry and chalky and not the easiest to blend but Havoc knocks it out the park. It has a stronger green and less red undertone than Club and it is stunning. These are the kind of shades I love-and when the texture is also spot on I am completely sold. 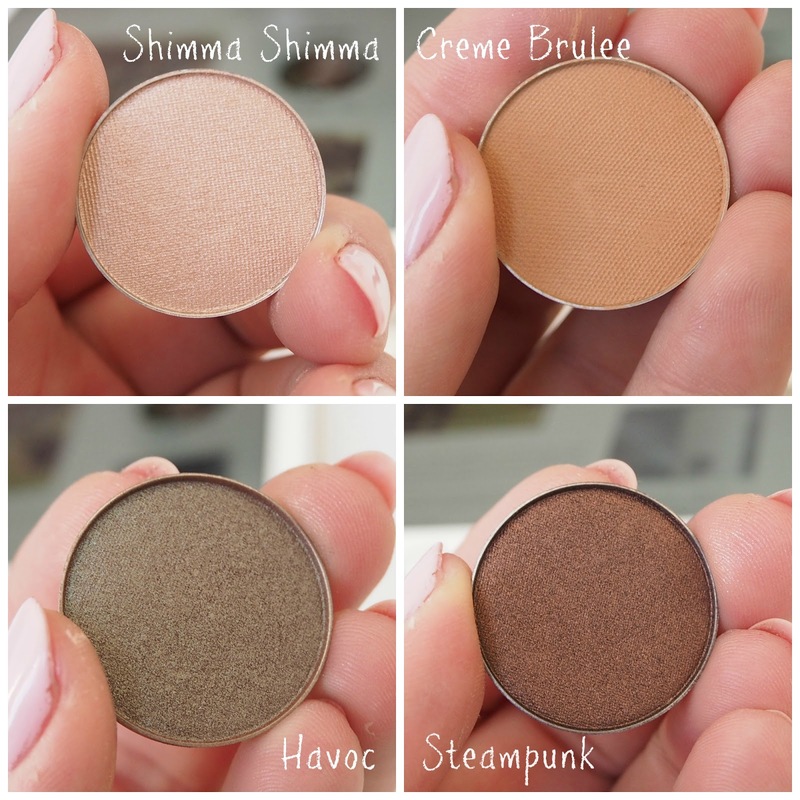 I've used it all over the lid and as a crease colour-it looks amazing on the outside of Steampunk even though they are both dark shades. I feel kind of like a grown up mermaid when I wear it. Just when I think it can't get better, there is Steampunk. A dark brown base with a reddy, almost plummy undertone to it, it is so beautiful. Since I started using the MAC Burgundy x 9 I have been so into these warmer toned, satin finish shades. Steampunk is not quite duochrome but it is rich and smooth and opulent. However, I exercise caution when using this shade-it has a fair amount of fall out compared to the others and if you try to clean it away from under your eyes with a fluffy brush it smears black everywhere. If you're using this shade, use shadow shields or do your eye make up first and then the rest of your face once you have cleaned up the fallout. Apart from that, it's an amazing shade. At a price point of £4.95 these excel, hence why I have just received another big order-texture/pigment/lasting power, all massive ticks. I just wish Beauty Bay would ship to the UAE-it would make life a whole lot easier! Two more things I want to mention in this post-the blog I am reading on my iPad in the first picture is my friend Antonia's rebranded blog Allure La Vie, which you definitely need to go and follow. Everyone needs an Antonia in their life-she is sassy and beautiful and funny and just gets life. She is also the hardest working person I know. I have been loving her re-brand and she has been writing some cracking posts-I loved The Biggest Battle-Your Inner Critic last week, but you can expect beauty, food and lifestyle posts on her blog. The second thing is much more fickle-and it's the mascara I am wearing in the last photo. It's Dior Iconic Overcurl mascara and I really love it. It is quite a dry formula but the curved brush makes it easy to grab on to every lash. It's really black, it lengthens and thickens without clumping and it does actually add some curl to my lashes-something my lashes are pretty averse to. Have you tried Make Up Geek? Any recommendations?